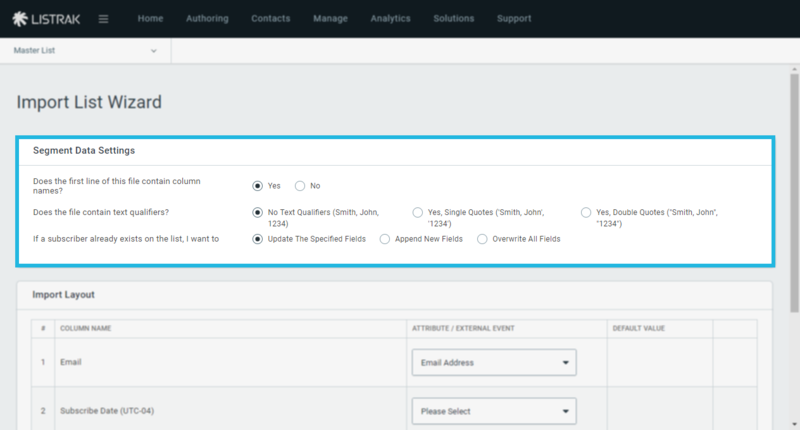 The Import List Wizard allows you to either Subscribe a list of contacts or Unsubscribe a list of contacts all at once. You can add multiple contacts to a list at one time using the List Import Wizard. If you only want to subscribe or unsubscribe an individual contact, use the Subscribe/Unsubscribe feature. The Import List Wizard requires a minimum of two contacts on your file to import. 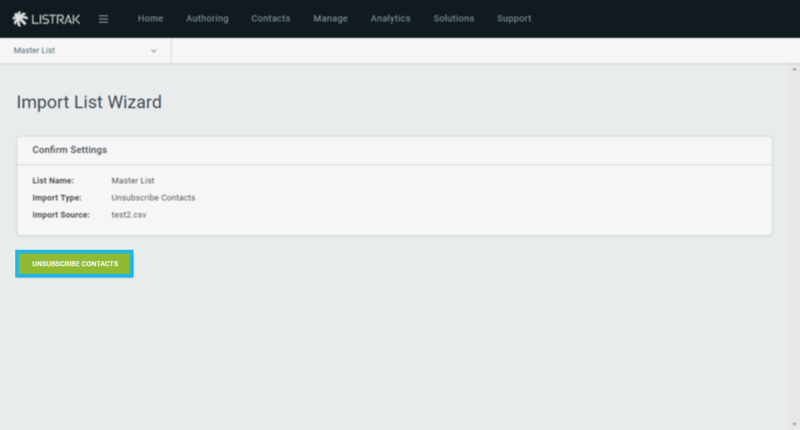 NOTE: You can also import your existing Salesforce or Omniture contacts. 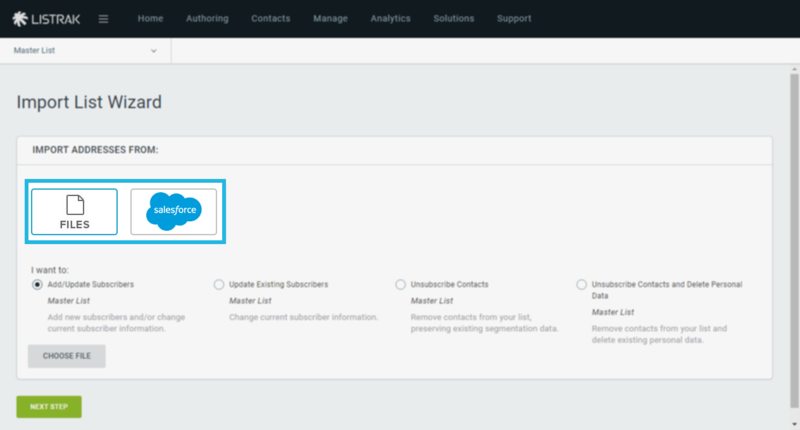 Learn how by reading Import Contacts from Salesforce. 3. Choose the purpose of your import from the below selections. To learn the difference between these options, read Import List Wizard Import Types. 4. Select your file and click Choose File. 5. Navigate to your file via the pop-up prompt. 6. Select the file you'd like to import. 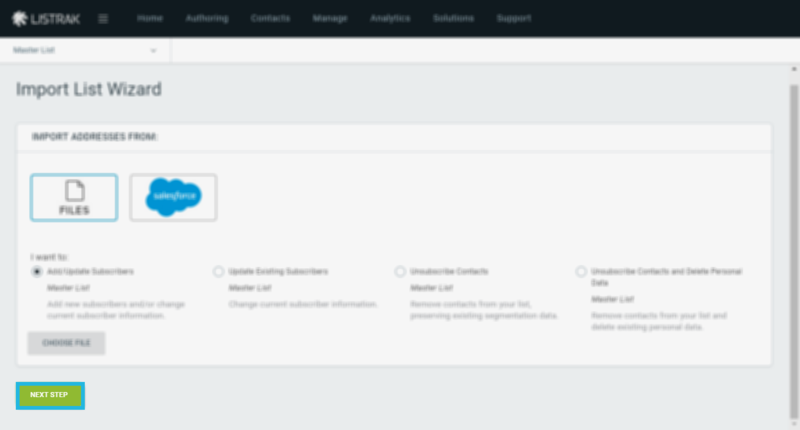 After you have uploaded your list, you can either subscribe, update, or unsubscribe these contacts. To subscribe a list of contacts, you can use either "Add/Update Subscribers" or "Update Existing Subscribers." Both options take you to the same screen. After you have selected the file you'd like to import, select whether you want to Add/Update Subscribers or Update Existing Subscribers. In the segment data settings, you have multiple options. These will vary depending on the type of file you are importing and are explained below. Does the first line of this file contain column names? The first question is in place to establish whether or your file starts with column headers. You can either define column headers, like email, first name, last name, or you can leave them undefined. Most people define column headers simply for consistency. Does the file contain text qualifiers? This question will only appear with a text file import and asks if your file contains text qualifiers. Listrak gives you three options: no text qualifiers, single quotes as a text qualifier, use double quotes as text qualifiers. Learn more in the article Text Qualifiers. Update the Specified Fields: This is the default and recommended choice. This option will update only the fields that you are specifying in your file. If there is a blank in the file for one of the records, this function will skip over the field and leave what was there already in place. 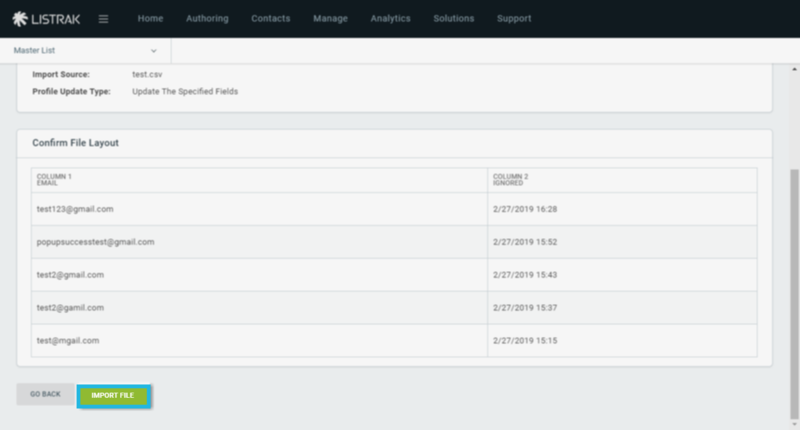 Append New Fields: This option only adds new information. 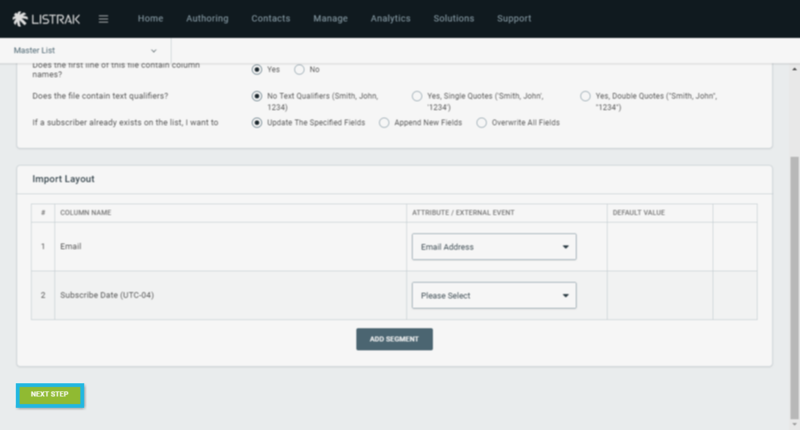 For example, if we are importing a file that includes first name and last name, and the contact we are importing has a first name, but no last name already on the list, it will only add the last name column to that contact's profile. Overwrite All Fields: This option will update and overwrite every field in the file. For example, if you have a file that contains blanks in the first name column, and you have contacts that have a first name, this will overwrite the value with blank instead of skipping over the field. After you have defined your segment data settings, you must define your import layout. 1. Click the Please Select drop-down menu. 2. Find the corresponding segment. 3. Repeat for each column as necessary. NOTE: After you have selected which segment the column should line up with, you have the option to give the field a default value. This will take any blank field and populate it with a value. For example, if you wanted to add a default first name, you could give each customer that doesn't have a first name, the name of "Loyal Customer." If you'd like to add a segment that wasn't in your file, you can use the Add Segment button to add subsequent attributes. To learn how to do this, read more in How to Add Segments Using the Import List Wizard. 5. 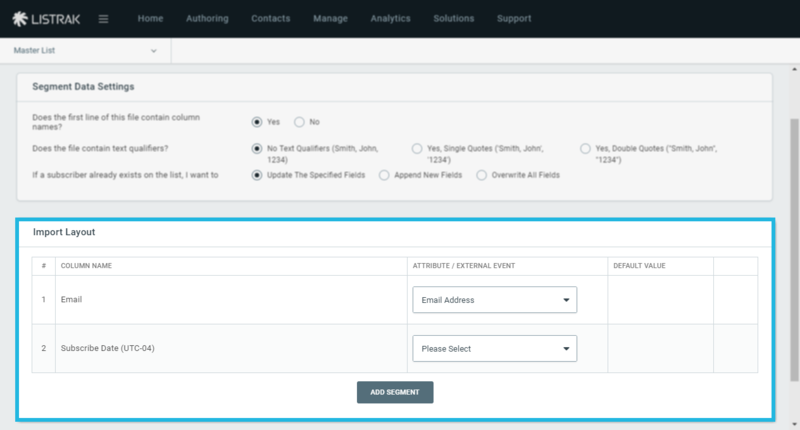 After you have clicked Next Step, you will be presented with a confirmation screen.This will show you what List, Import Type, Import Source and Profile Update Type. This will also give you a snapshot of what your import will look like so you can confirm that each column is going to the right segment. 6. Once you have confirmed your settings and file layout, you can click Import File. After the process is done importing the contacts, you should receive a List Import Summary confirmation email. If you want to unsubscribe a list of contacts, use the Unsubscribe Contacts option. 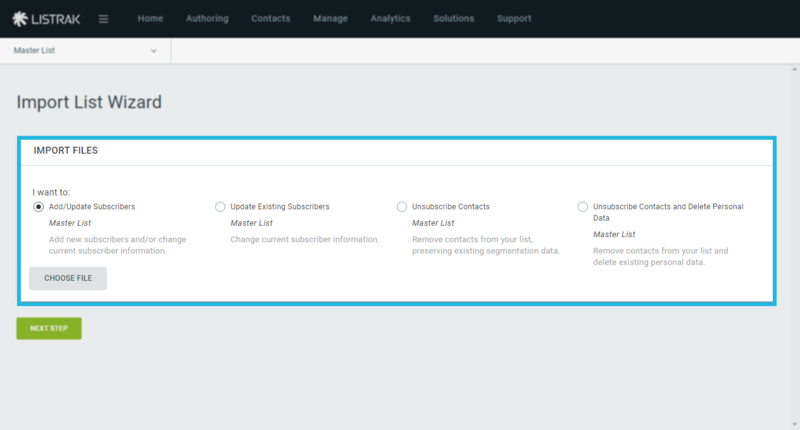 NOTE: If you unsubscribe a list of contacts, you can't re-subscribe them by the List Import Wizard and would need to contact Listrak Support by emailing support@listrak.com or by calling 717-627-4528 x1. After you have confirmed the settings, click Unsubscribe Contacts to finish the unsubscribe import. After the import has been completed, you'll receive a List Import Summary confirmation email.